The most common question we get…… How are you going to reach that without a lift?? That is almost 30 feet from the ground. 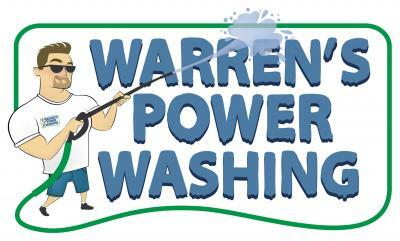 Warren’s Power Washing is a family owned and operated full service pressure washing company. We hold ourselves to a higher standard of work and it is reflected in the response we receive from word-of-mouth and the the growth of the company. We specialize in not only getting your property clean but keeping it clean. We have been serving Marion County for 10 + years. Our goal is to provide you with professional cleaning and a high expectation of Customer service. We follow the strict guidelines from the Asphalt Roofing Manufacturers Association Website. To learn more details of our roof cleaning services please click the link below. Hire a professional to clean your concrete, one mis-step can cause thousands. Cleaning your concrete seems easy but in-fact a single mis-step can cause you thousands in repairs. There are several different steps to cleaning your concrete surfaces correctly, its isn’t just about blowing it away. Click the link to find out the details we use to re-new your concrete surfaces. We have Numerous Ways To Clean Your Commercial Property Check Out all the pressure washing services we provide. We love cleaning pool Enclosures and the results speak for themselves! Having a pool enclosure or a screen room is almost a necessity in Florida. Click HERE to find out more about our procedures and how we do things “different” than some. We lived in the Hospitality Industry for 20+ years living and learning the CUSTOMER FACTOR. In any business that wants to thrive we know it depends on the customer. Without a customer you don’t have a business you have a hobby. We strive to make sure every customer feels like a part of our family, and it shows in our retention and word of mouth. At Warren’s we strive to have and provide the highest standards in the industry. We know that your worked hard for your money and we insure that you are investing it wisely. From your initial inquiry call to the “Have a nice day!” we strive to provide you with the highest quality service. Thank you for the FANTASTIC job you did on my house. My house looks like new! Your service was above and beyond my expectations. You not only did the roof, driveway, sidewalks,backporch and whole house- You also did the front flower bed brick edging! Very Efficient and our house is great! We hired Warrens Power Washing to pressure wash the entire house from top to bottom as well as our driveway, back porch and sidewalk. It was completed in just a couple of hours and looks great! The before and after pictures are night and day. We are definitely going to continue using them for regular maintenance. I highly recommend using them for any project! Warren’s Power Washing is a full service Pressure Washing service. We provide pressure washing services to the tri-county area.